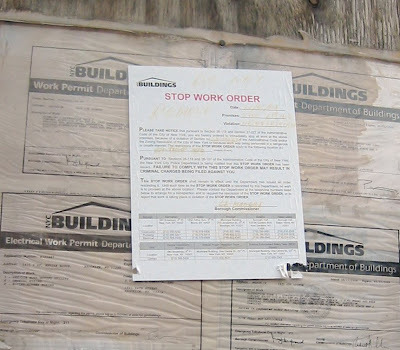 This very rained-on Stop Work Order at 5405 6th Avenue has been up since November. True enough, work seems to have stopped for now, but I wasn't able to find any record about why the work was stopped. (update: oh yes I did. And part of it has to do with smoking.) The sign itself is so faded that it's difficult to make any words out. Only "entire job" and the address are clear. Well, that and DO NOT REMOVE. Perhaps it's because one sign was ripped down within a day? Or, perhaps it was because the inspector noticed the "marble" facade going up on the ground floor? The horizontal light fixture is hanging precariously as well. Sad that this is what the previous building made room to allow.